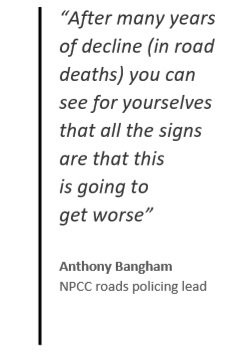 The country’s leading roads policing officer has expressed concern that road deaths ‘are going to get worse’ – and that previous declines in fatalities will be ‘reversed’. 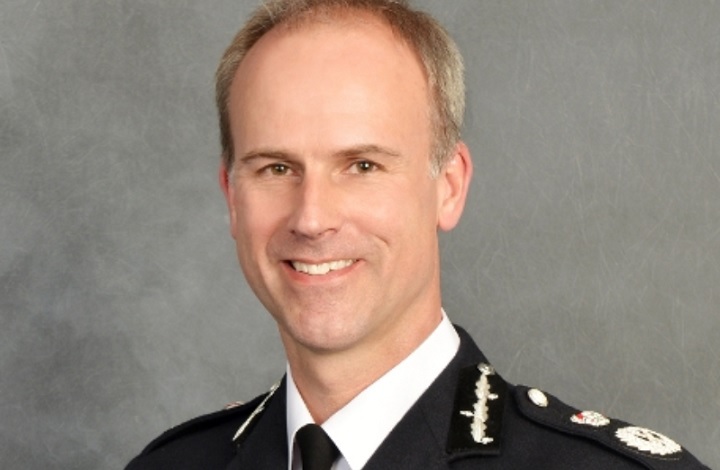 Speaking at the National Roads Policing Conference last month, chief constable Anthony Bangham, roads policing lead for the National Police Chiefs’ Council (NPCC), set out his vision for the UK to have the ‘safest roads in the world’. Mr Bangham, who previously controversially suggested that drivers travelling at just one mph over the speed limit should be prosecuted, pointed out there are now 20,000 fewer police officers than a decade ago – and fewer dedicated roads policing officers. He said that putting police officers back on the roads in ‘significant numbers’ is essential for saving lives. Mr Bangham said: “Police officers play a vital role in disrupting criminality and reducing death and serious injury on our network. “If we look at the data, it shows a 39% reduction in deaths since 2007. But from 2011 onwards, you start to see a flattening out. Mr Bangham said it was ‘unfortunate’ that the road safety minister Jesse Norman was unable to address the conference in person, instead sending a video message, as the Government ‘needed to heed his warnings if they are serious about reducing road fatalities’. Mr Bangham also told conference delegates that his focus for 2019 will be to work towards the goal of safer roads, safer speeds, safer road users and vehicles and post-crash response. He encouraged more forces to prioritise roads policing and join him in calling for greater investment. Hugh, yes some are occasionally out sometimes or its done by civilians reporting speeders. When I was in the service there was again only a small number of officers specifically reporting speeders. There were many other offences that the ordinary copper reported. Speeding is only one of them. If there was a greater presence on the streets then the police constable could be better able to stop offenders re. bad tyres, dangerous parts, running red lights, dangerous or inconsiderate driving etc. with a more active and pro active presence the general public would get to understand that they can’t get away with perhaps the smaller things and then the big things are less likely to happen. A stitch in time saves nine. Rob and Pat: I recently saw two (Cheshire) police officers enforcing a 20 limit- so they are still prepared to enforce as and when necessary. I’ve also seen similar exercises in the neighbouring Counties of Merseyside and North Wales as well – I don’t think they’ve abandoned enforcement just yet. There’s also the various enforcement cameras plus dashcam footage from the public to work with. It’s not that the Police don’t have the resources. Part of the problem is that police work has gone away from traffic enforcement where it once was and is now been prioritised with other matters of importance. Such as drugs, alcohol, sexual predation, domestic violence and other matters that have become more apparent in the news and press creating greater public concern and alarm . It seems particularly galling but possibly significant that whilst the police have shed some 20.000 experienced officers it still retains about that number of civilian CPOS who have little or no powers to do much. Powers that come only with the office of Constable and which could be useful in patrolling our streets. Protecting life and property, maintaining order, preventing crime and reporting simple traffic offences and other matters of concern to the general public. Good to hear this message coming from the top. No surprise though as we’ve been anticipating that such a situation could arise for several years partly due to cuts in road safety budgets and to the laws of diminishing returns. Ability (resources) to enforce is a key part of road safety and casualty reduction. Any new initiatives for road safety coming from the various governments of the UK need to include much more funding for roads policing. If they don’t include the cash, any new laws will be lightly enforced (if at all) and therefore largely ineffective.